When Cairo governorate announced yesterday that a professional committee is to be assigned to study the possibility of demolishing the National Democratic Party’s (NDP) building and transforming the land into a park, archaeologists and museologists were furious. Although the land had originally been in the possession of the Egyptian museum, no one has asked them to contribute to the committee. 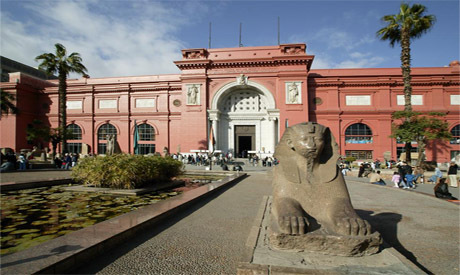 “It is about time that this land, which originally belonged to the Egyptian museum, was returned,” Tarek El-Awadi the director of the Egyptian museum told Ahram Online. He said that following the 1952 revolution the land was taken from the Egyptian Antiquities Authority and since that time has been used by the various ruling parties established by the regime, the last in the line being the NDP, which shared the massive Nile-side premises with the National Council for Women, headed by the president's wife, Suzanne Mubarak, and the Arab Bank. The building was gutted by fire on the evening of the 28th of Januaray, in the midst of fierce attacks by pro-regime thugs and security foces on the demonstrators in Tahrir Sq. El-Awadi asserted that Egyptian archaeologists and museum curators were extremely upset as they were not invited to the meeting to discuss the future of the plot of land. He told Ahram Online that they are calling on Prime Minister Ahmed Sharaf and the Army Supreme Council to return the land to its original owners, the Ministry of State for Antiquities Affairs. He denied that the land belongs to the Cairo governorate. The land was part of the museum’s safe zoning since its construction in 1901 and was the museum’s Nile port where ships transported monuments from their original location in Luxor and Aswan in Upper Egypt to the museum for display. He said that official ceremonies held to welcome the ancient Egyptian royal mummies were also organised there. El-Awadi suggests that after the demolition of the gutted NDP’s building, the land could be made into an open-air museum, showcasing some of the museum’s collection, which is now overflowing in its internal displays. THE NDP HEADQUARTERS WERE CONFISCATED ILLEGALLY BY THE FORMER DEFUNCT SOCIALIT ARAB UNION ORGANISATION.BOTH THESE PARTIES DONE MAJOR DAMAGE TO THE DEMOCRATIC ASPIRATION OF THE EGYPTIAN PEOPLE.THIS BUILDING SHOULD BE DEMOLISHED AND PROPERTY RETURND TO ITS LAWFUL OWNER, THE EGYPTIAN ANTIQUITY'S AUTHORITY.